Altogether, our data demonstrate cannabinoid-induced upregulation of ICAM-1 on lung cancer cells to be responsible for increased cancer cell susceptibility to LAK cell-mediated cytolysis. …our results collectively suggest that human sebocytes utilize a paracrine-autocrine, endogenously active, CB2-mediated endocannabinoid signaling system for positively regulating lipid production and cell death. “Endocannabinoids represent a class of endogenous lipid mediators, that are involved in various biological processes, both centrally and peripherally. The prototype member of this group of compounds, anandamide, regulates cell growth, differentiation and death; this holds true also in the skin, that is the largest organ of the body constantly exposed to physical, chemical, bacterial and fungal challenges. The epidermis is a keratinized multistratified epithelium that functions as a barrier to protect the organism from dehydration, mechanical trauma, and microbial insults, and epidermal differentiation represents one of the best characterized mechanisms of cell specialization. In this review, we shall summarize current knowledge about the main members of the so-called “endocannabinoid system (ECS)”, in order to put in a better perspective the manifold roles that they play in skin pathophysiology. In particular, we shall discuss some aspects of the molecular regulation by endocannabinoids of proliferation and terminal differentiation (“cornification”) of mammalian epidermis, showing that ECS is finely regulated by, and can interfere with, the differentiation program. …given the extensively documented accumulation of phytocannabinoids from smoked marijuana in the pilosebaceous unit (where they become incorporated into the hair shaft), it is very likely that CBD can reach the sebaceous glands as well, can accumulate, and may well reach “therapeutically sufficient” concentrations there. 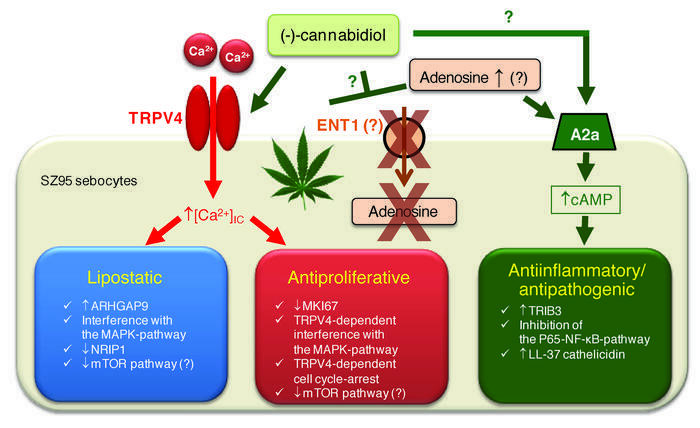 [A role for the endocannabinoid system in hepatic steatosis]. “The endocannabinoid system (SEC) is an important modulator of several metabolic functions. “Guillermo Velasco and colleagues, at Complutense University, Spain, have provided evidence that suggests that cannabinoids such as the main active component of marijuana (THC) have anticancer effects on human brain cancer cells. In the study, THC was found to induce the death of various human brain cancer cell lines and primary cultured human brain cancer cells by a process known as autophagy. Consistent with the in vitro data, administration of THC to mice with human tumors decreased tumor growth and induced the tumor cells to undergo autophagy. “There is a great concern about the safety of THC-based drugs in older people (≥65 years), as most of THC-trials did not include such group. In this phase 1, randomized, double-blind, double-dummy, placebo-controlled, cross-over trial, we evaluated the safety and pharmacokinetics of three oral doses of Namisol®, a novel THC in tablet form, in older subjects…. The non-psychotropic plant cannabinoids, cannabidivarin (CBDV) and cannabidiol (CBD), activate and desensitize transient receptor potential vanilloid 1 (TRPV1) channels in vitro: potential for the treatment of neuronal hyperexcitability. “Epilepsy is the most common neurological disorder, with over 50 million people worldwide affected. Recent evidence suggests that the transient receptor potential cation channel subfamily V member 1 (TRPV1) may contribute to the onset and progression of some forms of epilepsy. Since the two non-psychotropic cannabinoids cannabidivarin (CBDV) and cannabidiol (CBD) exert anticonvulsant activity in vivo and produce TRPV1-mediated intracellular calcium elevation in vitro, we evaluated the effects of these two compounds on TRPV1 channel activation and desensitization and in an in vitro model of epileptiform activity. Long-Term Cannabidiol Treatment Prevents the Development of Social Recognition Memory Deficits in Alzheimer’s Disease Transgenic Mice. “Impairments in cognitive ability and widespread pathophysiological changes caused by neurotoxicity, neuroinflammation, oxidative damage, and altered cholesterol homeostasis are associated with Alzheimer’s disease (AD). 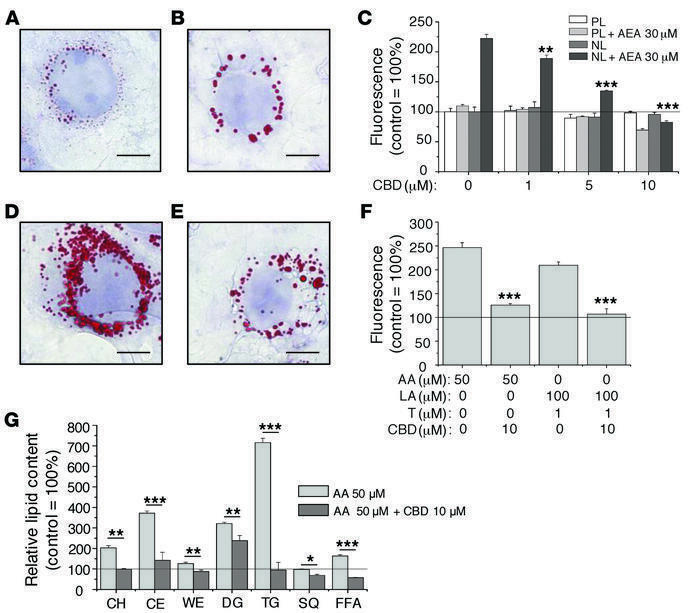 This study is the first to demonstrate CBD’s ability to prevent the development of a social recognition deficit in AD transgenic mice.